This hot topic explores interventions with families affected by substance use, and includes issues as varied and important as the (lack of) recognition that relatives might also be ‘carers’, why we should think of family members as individuals needing support as well as parts of a family unit needing support, and the dilemma for service providers about how to safely and effectively deal with conflict in families. Documents retrieved by this search focus primarily on the welfare of the families themselves, but will include some on family therapies promoting the welfare of the problem user; another search focuses on this topic instead. Given the nature of addiction, it is not uncommon for the family members of a person with substance use problems to also fulfil a ‘caring’ role, adding another layer to the difficulties they face. The Care Act 2014 limited the definition of a carer to adults, but the Carers Trust points out that there are an estimated 700,000 young people under the age of 18 in the UK also helping to “look after someone in their family, or a friend, who is ill, disabled or misuses drugs or alcohol”. • provide information about, and facilitate contact with, support groups, such as self-help groups specifically focused on addressing families’ and carers’ needs. • normally consist of at least five weekly sessions. Caring is often an invisible and unpaid activity. When marginalised and stigmatised problems are added to the mix, or are the source of the caring work, this can compound the invisibility – even to the point where family members don’t perceive themselves as carers. The high esteem in which carers of a relative with a disability or chronic health condition such as diabetes are held doesn’t always translate to substance use problems, which tend to be viewed through a moral lens. There is growing evidence that supporting the relatives of people affected by substance use can bring huge benefits to the whole family, as well as potential cost-savings to services. Interventions targeting family members’ own needs can result in increased resilience, life satisfaction and relationship satisfaction, decreased stress and distress, and benefits for the people around them, including children. Despite this promising evidence, there has historically been a lack of recognition of family members’ support needs (in particular, those of adult family members) in drug and alcohol policy and guidance. In 2012, the UK Drug Policy Commission’s report The Forgotten Carers highlighted this gap, and recommended more assertive promotion of help for adult relatives in primary care settings, and routine assessment of their needs when relatives with substance use problems engage with treatment. The 2017 Drug Strategy acknowledged the impact drug use can have on families, but focused family-based solutions on the prevention and treatment of drug use – highlighting the need to target support at those most at risk of “misusing drugs”, such as vulnerable young people, vulnerable families, and victims and perpetrators of domestic abuse, and the need for vulnerable families to be supported to break inter-generational pathways to dependence. Beyond this the strategy advised that “local areas should ensure that the support needs of families and carers affected by drug misuse are appropriately met”, but did not specify or direct how. Whether in any event this strategy is the right context in which to recognise and respond to family welfare is debateable, sitting as it does within the remit of the Home Office rather than health or social care policy teams. Clinical guidelines from the UK’s official health advisers (view a summary here, commentary here, and specific implications for families above) recommend that as well as explaining options for abstinence-oriented, maintenance-oriented and harm-reduction interventions to clients with substance use problems, staff should discuss with them whether to involve their families and carers in their assessment and treatment plans, ensuring that the service user’s right to confidentiality is respected. At least two separate (but related) support needs are evident among the relatives, partners, and friends of people with substance use problems: firstly, wanting to contribute to the treatment of their loved one; and secondly, needing help to deal with their own stress. According to reviews of family-based drug treatment, these two needs are reflected in treatment approaches – namely by working with family members to facilitate the entry and engagement of the user in treatment, interventions for family members in their own rights, and treatment based around joint working with family members and the substance user (1 2). 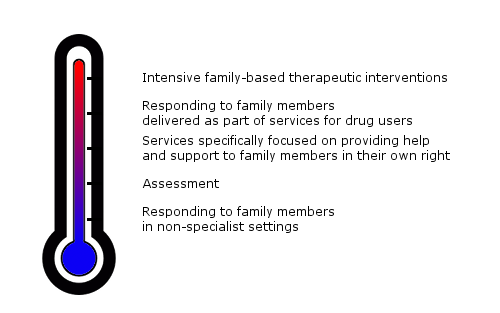 In 2009 the UK Drug Policy Commission designated five different levels of response to family members affected by drug problems: responding to family members in non-specialist settings; assessment; services specifically focused on providing help and support to family members in their own rights; responding to family members delivered as part of services for drug users; and intensive family-based therapeutic interventions ( image). These levels weren’t intended to depict a hierarchy of provision (ie, level 5 is not ‘better’ than level 4), but rather the range of interventions that should be available in order to meet the differing needs of family members. The key principle was that “there should be a range of flexible services of different intensities that can respond to the varied and complex needs of families affected by drug problems” (emphasis added). Three years later, a follow-up report contrasted the recommended levels of provision against actual provision, as described by 43 stakeholders, from five regions in England. Click here to see the comparison. Recommended: Good quality leaflets and access to web-based information and signposting; and family members being able to approach services and agencies to request advice, information or direction towards sources of help. This level requires training of staff so that the impact of drug problems on families is understood. Reality: The extent to which the needs of family members were recognised and assessed in non-specialist settings was unclear. In some areas there was evidence of carer assessments but the volume appeared low compared to expected prevalence. Only one example was given of a plan to develop and coordinate a response to family members across a range of generic services taking into account the variation in presentation and needs of this group. Other areas acknowledged the need to work more closely with GPs (family doctors) and increase awareness and identification at the primary care level. Recommended: Existing evidence strongly supports the need to assess family needs and relationships when users enter or approach treatment, a practice not currently widespread within treatment services. Reality: In general, there appeared to be a lack of any systematic and comprehensive way of implementing assessment, although some areas described work in progress. In one of the areas, there were plans to assess family members every time someone was assessed for a drug problem, and even though this was at an early stage, there was a commitment to take this forward. In another area, there was a centralised gateway service that assessed all family members and the expectation was that when family members were identified, they were referred to this service. Across all other areas, despite some good examples of assessments in specific services that had family member components, there were no clear action plans in place to increase this level of provision. Recommended: Evidence-based interventions can be delivered in family-focused services and provide a useful framework for workers. Reality: This was the area of provision most areas had concentrated on. All areas described some provision for family members including information, general support, advice, and signposting. Counselling was available in most areas although the majority were offering generic counselling rather than approaches specifically developed for and focused on the impact of drug addiction upon the family member. In a minority of areas, reference was made to more evidence-based interventions. Recommended: The response to family members should be delivered as part of services for drug users, in line with clinical practice recommendations from NICE. Reality: Provision was patchy and perceived as a challenge. Out of 16 areas, six described attempting to involve family members in the treatment of the drug user. This posed a number of challenges, including how to manage working together in a positive way, how to engage families in this process and how to deal with worries from drug users when considering involving family members. No specific approaches were mentioned. There was little mention of the offer of more structured approaches for family members within treatment services for drug users, unless they were ‘ad hoc’ or there was a family service component attached to the drug service. Recommended: Some services will have the capacity and capability to deliver more intensive interventions. Behavioural couples therapy has been recommended as part of guidelines from NICE and can be used with drug users who have non-drug using partners. Multidimensional family therapy, the community reinforcement approach, and social network approaches, also show promise and together cater for the needs of the whole range of family relationships – but require a higher level of training and supervision for staff, which will not be available in all services. Reality: The overall delivery of intensive family interventions or programmes focused on helping adult family members was low. Out of 16 areas, only four described some form of intensive family programme. Whilst there were references to parenting programmes, the availability of programmes focused on the adult family members was very low. Two areas described taking part in a research pilot study of social behaviour and network therapy. Two British studies explored the feasibility of a short intervention with relatives in a primary care setting, raising some doubts about how successfully an intervention of this kind could be rolled out across the UK. The first study gathered the views of 27 patients who had participated in up to five sessions with a primary health care worker. These patients reported that after the intervention they relied less on unhealthy coping strategies and felt physically and psychologically better. This study evolved into a second larger study involving 136 local doctor’s surgeries in England. Patients were allocated to one of two groups this time, one offering five sessions, and the other offering a single session. There were no significant differences between the groups. Instead, across both groups there were significant improvements on all the assessed outcomes. However, it proved very challenging to engage primary health care workers and local doctor’s surgeries, despite the offer of funding. It could be that incorporating substance-related questions within general health screening for the adult relatives of people with substance use problems may be a more acceptable strategy in primary care. The studies described above are rare examples of interventions that consider how substance use might be affecting adults around the person with a drug or alcohol problem, and what support family members and friends might need in their own rights. Most studies in the field of family interventions have focused on protecting the welfare of children and families where the parent or carer has a substance use problem. Scottish approaches for working with children, young people and families where problematic alcohol and/or drug use is a factor advocate ensuring that child protection, recovery and wider family support concerns are brought together within a coordinated approach to giving the best support possible. In 2012, Getting Our Priorities Right outlined practice guidance for child and adult service practitioners working with children, young people and families where problematic substance use is a factor. Key principles were a ‘whole family’ approach for assessing need and early intervention activities – “working together effectively at the earliest stages to help children and families and not waiting for crises – or tragedies – to occur”. The Australian Institute of Family Studies has reviewed literature on the outcomes of children raised in families with multiple problems including parental substance misuse. Their review notes the ‘risk factors’ for children living in families affected by substance use, but adds that interventions which aim to build on parental strengths generate ‘protective factors’ which mitigate those risks. It argues that another crucial consideration in treatment approaches should be the wider social environment, in which poor housing, unemployment and social isolation influence outcomes for children. They conclude by saying that “families will fare best when they are engaged in the process of treatment, feel a part of the treatment, have a commitment to the treatment and hold the view that they are working with the service to achieve common goals”. Engagement in treatment was explored in a reflection on a pilot study in Scotland. Though contact might be initiated against parents’ wishes and proactive monitoring is essential, the authors advised that successful early intervention with families is reliant on generating their voluntary participation, and requires close attention to means of facilitating positive and motivated parental engagement. Interventions with families have typically been characterised by the central aim of monitoring child welfare. Fearful of the consequences of the ‘enquiring gaze’ of social services, parents may resist meaningful engagement. This particular study explored resistance in the context of six families affected by substance use, defined as in need of supportive intervention. The authors suggested that resistance could be overcome by improving the way services communicate with families, and “exploration of the possibility of putting some distance between the offer of support and an often all too close link with the threat of punitive action”. The Australian National Council on Drugs (ANCD) commissioned a review of policy in relation to child- and family-sensitive practice in Australia. The report referenced a workforce development guide, describing child- and family-sensitive practice as “raising awareness of the impact of substance abuse upon families, addressing the needs of families, and seeing the family – rather than an individual adult or child – as the unit of intervention”. Option 2 was a crisis intervention service, funded by the Welsh Assembly, designed to view the family as the unit of the intervention. Specifically, it focused on working with high-risk families, where there were serious child protection concerns related to parental substance use. The intervention lasted four to six weeks, and used a combination of motivational interviewing and solution-focused counselling styles. An early evaluation of the service found that families liked the service and that it reduced the need for children to enter care, generating significant cost-savings for local authorities. A subsequent evaluation confirmed that this model significantly reduces the need for children to enter care, is likely to generate very significant cost-savings for local authorities and other social care, health and criminal justice agencies, appears to be an effective way of engaging and helping parents with serious drug and alcohol problems to significantly reduce their drug or alcohol use, and overall, improved family wellbeing and parental welfare. Speaking to the need for integrated or coordinated services, parental profiles from UK family drug and alcohol court research reinforce the picture found in other studies of the many difficulties parents experience in addition to substance use, especially the so-called ‘toxic trio’ of substance misuse, mental health issues (37% of family drug and alcohol court cases and 40% in ordinary proceedings) and domestic abuse (71% and 64%). Responding to the need for multi-pronged services to meet multiple needs, programmes have been developed which integrate addiction treatment with on-site pregnancy, parenting, or child-related services, typically providing individual addiction treatment, maternal mental health services, trauma treatment, parenting education and counselling, life skills training, prenatal education, medical and nutrition services, education and employment assistance, childcare, social services, and aftercare. One pilot study trialled residential substance use treatment integrated with a brief (10 sessions) yet intensive attachment-based parenting programme for new mothers. Subsequent observations of parent and child together found more supportive and sensitive parenting behaviours. In their experience women constituted a minority of defendants, and their offending tended to be less diverse and generally less serious – public order, theft, and drug possession were mentioned most often. Women’s problems were also seen as more inter-related and hard to disentangle – for example, frequently having sole or main responsibility for children and other dependents (eg, elderly relatives), being victims of domestic abuse, suffering from mental illness, and having histories of abuse as children. One of the major barriers to coming forward for treatment is the stigma, shame, and guilt around having a problem with drink or drugs – something which may be experienced more acutely among parents. For women in particular, who more often have primary caring responsibilities, the concern is not just about how they will be perceived as mothers, but that once they’ve disclosed “they will be deemed an unfit mother and lose custody of their children”. The family drug and alcohol court model recognises the difficulty for parents in separating their substance use and recovery from their caring responsibilities and desire to keep their families together. Unlike traditional family courts, they have a team of experts from substance use and child welfare, aligning the treatment goals and philosophies of both sectors. There are currently nine teams in the UK, working in 12 courts and servicing 15 local authorities in London, Gloucestershire, Milton Keynes and Buckinghamshire, East Sussex, Coventry, South West Peninsula (Devon, Plymouth and Torbay), Kent and Medway, Southampton, and Leeds. A pilot study in London suggested that compared to ordinary care proceedings, family drug and alcohol courts produce better parental and child outcomes at a lower cost. Five years later, the family drug and alcohol court remained more successful than ordinary services in helping parents to sustain recovery, in minimising risk, and in keeping families together. What the family drug and alcohol court couldn’t do, however, was remove risks entirely for families further down the line. Written information collected from case files in relation to ‘life events’ highlighted the continued challenges faced by families. The two years after proceedings was the period of maximum risk, indicating that support during this period could for many parents help prevent problems accumulating and taking hold. The above evaluations focused on families going through care proceedings between 2008 and 2012. Since then a number of changes have come into effect. Perhaps most pertinent to the family drug and alcohol court was the introduction of a 26-week time limit for completing care and supervision cases (under the Children and Families Act 2014). The implications were addressed in a 2014 report, which referenced professionals’ concerns about the “extent to which this will help or hinder attempts to improve outcomes for children affected by parental substance misuse” – that it will, in theory, “reduce the time available to test parents’ motivation and ability to control their problematic drinking or drug use, through a therapeutic intervention overseen by the court”. Another family-centred approach, this time from the United States, aimed to support mothers facing loss of custody to get to the point where they could be reunited with their children. The Engaging Moms Program helped them to comply with court orders, engage with substance use treatment and develop their parenting skills. A small-scale study compared its effectiveness with that of traditional case management (coordination of services). In comparison, more mothers in the Engaging Moms group retained their parental rights and completed the drug court programme. Furthermore, at the three-month follow-up participants in Engaging Moms reported significantly stronger therapeutic relationships with their counsellors, a factor known to facilitate ongoing engagement with treatment. A strong therapeutic relationship is often cited as an important platform for successful interventions, as is a programme tailored to the needs of the client. A US-focused progress review advocated integration at the service delivery level through a comprehensive assessment which documents all the client’s co-occurring health and social problems, and which systematically matches service needs to problems in the context of a positive client-provider relationship. Few systematic reviews have been conducted to assess whether integrated services improve parenting outcomes, but the limited evidence does suggest integrated services may generate small improvements in parenting. Though by no means a spectacular result, among high-risk families this may have the knock-on impact of reducing the need for foster care and improving the wellbeing of children. Following riots in England in 2011 triggered by the death of Mark Duggan in Tottenham in London, a government initiative called the Troubled Families Programme was announced. Its goal was to ‘turn around’ the lives of the 120,000 most ‘troubled families’ in England by May 2015. The initial definition of a ‘troubled family’ excluded many of the deeply embedded social issues described above, instead focusing on addressing youth crime or anti-social behaviour, children regularly truanting or not in school, adults on out-of-work benefits, and families imposing high costs on the taxpayer. • parents or children with a range of physical and mental health problems. An interim report from the national evaluation in 2014 gave insight into the characteristics of families actually reached by the Troubled Families Programme, showing that crime, anti-social behaviour and substance abuse, even at fairly low levels, represented only small minorities of official ‘troubled families’ – 93% of families, for example, had no adults clinically diagnosed as being dependent on alcohol, and 93% had no adults with a clinical diagnosis of dependence on non-prescription drugs. Another Effectiveness Bank hot topic has examined the prominence of unemployment in the population of problem substance users, and the many barriers to work. It also raised questions about how realistic competitive employment is for people whose lifestyles have revolved around obtaining drugs (rather than honing their CVs) and perhaps gaining a criminal record in the process, at what point in a person’s journey the goal of employment should be on the table, if employment is predominantly a ‘means to an end’ of achieving recovery and reintegration, and whether it would be more fruitful to look beyond the binary outcomes of ‘being in work’ and ‘not being in work’. Furthermore, it prompted reflection on the impact of using potentially stigmatising language like the official government term “worklessness” – which suggests that not being in work (or at least not being in work recognised by the state) is a condition of the individual or family – when referring to people who probably not only have personal barriers to work, but also institutional and structural barriers. For many, unemployment is one of a multitude of factors that compose social exclusion, and have the cumulative effect of obstructing their ability to participate fully in society (including finding gainful employment). Disagreement and conflict is common in families, and may be exacerbated in those coping with problem substance use. But for Adfam, a UK charity working to improve life for families affected by drugs and alcohol, it is important for professionals to know and feel confident enough to distinguish between family conflict and domestic abuse, and to be aware of the risks of assuming either will automatically be alleviated when substance use problems are resolved. While there is a strong association between domestic abuse and substance use, and alcohol in particular is thought to escalate existing conflicts, the evidence shows that not all people attending alcohol treatment are abusive, nor do most domestic abuse incidents take place when the perpetrator is drinking or using drugs. So, it is not the case that there is a simple causal relationship between substance use and domestic abuse. Substance use is better understood as a ‘disinhibitor’ which gives a perpetrator the belief that they will not be held accountable or responsible for their behaviour. Treating this as “responsible disinhibition” enables professionals to recognise that the perpetrator may experience some level of disinhibition as an effect of consuming alcohol or other substances, while still holding them responsible for their actions. In some cases, both partners might claim to be victims, or it may be apparent that both have used violence against each other. This does not necessarily mean that the violence is mutual – of equal significance on both sides – or that the causes and contexts are the same (eg, related to both partners drinking or using drugs). In circumstances where there may be bi-directional violence, it is important to think about context, intent, and effect – for example, did the person use violence to induce fear or to protect themselves, and what effect did the violence have? Against Violence and Abuse (AVA), a national organisation working to end all forms of violence against women and girls, urges professionals ‘not to make substance use an excuse’, writing that in addressing perpetrators of domestic abuse who use drugs or drink problematically, it is not sufficient to only address their substance use hoping that abuse will subsequently cease. This would not, for example, “address the many social and cultural factors such as perpetrator’s sense of entitlement and attitudes”, or “the complex dynamics of power and control” that often underpin domestic violence. 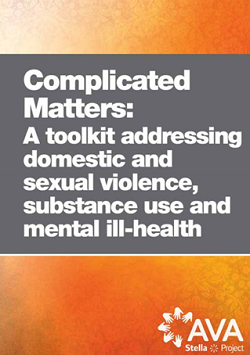 A toolkit and complementary eLearning programme produced by AVA were designed for professionals working with clients who have issues spanning substance use, domestic and sexual violence, and mental ill-health, and aimed to uncomplicate “complicated matters” by raising awareness about “how the three issues interlink and reflecting on the most effective ways to engage with individuals and families who are affected by these issues”. Admittedly, ‘thinking family’ is not as easy as it sounds for organisations trying on the one hand to keep families together or to treat the family as the ‘unit’ of the intervention, and on the other to ensure services are safe and conducive to vulnerable people making disclosures or talking about domestic abuse. As Adfam writes, “families are often the unheard and unseen victims when a loved one uses drugs or alcohol, and on top of the physical and psychological strains, they must struggle to get the support they need … all the while grappling with the stigma and shame from wider society”. Run this search for more on protecting and improving life for the families of problem substance users, or instead this search for information on interventions with families aimed at helping a relative with substance use problems. Also perhaps of interest is a collection constructed for Alcohol Awareness Week 2017 on the theme of ‘Alcohol and Families’, embracing two major roles for the families of problem drinkers: as recipients of support and therapy to promote their own welfare, and as therapeutic agents engaged in promoting the drinker’s welfare through family therapy or less formal involvement in treatment. Thanks for their comments on the original entry to Richard Velleman of the University of Bath and Jamie Pennycott of Southend’s Drug and Alcohol Team in England. Commentators bear no responsibility for the text including the interpretations and any remaining errors.